Former Deputy CM, Kavinder Gupta kick starting black topping of lanes at Chinar Mohalla, Channi Rama on Wednesday. 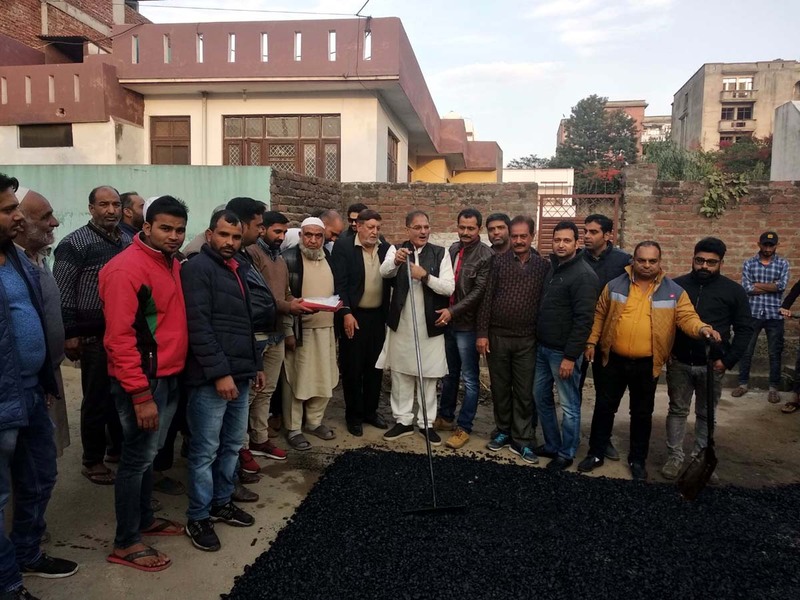 JAMMU, Dec 12: Former Deputy Chief Minister & Senior BJP leader, Kavinder Gupta started the work of black topping of lanes at Chinar Mohalla, Chhani Rama to be completed by PWD at the cost of 70 Lakhs. While addressing the gathering, Gupta said “BJP is committed for equitable development for all the three regions in the State”. BJP is committed to provide area based smart solutions to infrastructure and services in the State, he added. He said that number of road macadamization and up-gradation works have been taken up with special thrust on the use of quality material. Highlighting the achievements of present dispensation in PWD, PHE and other sectors, Kavinder Gupta apprised that more than 650 KM road length has been upgraded, more than 385 transformers and 14000 new electric poles have been installed in Gandhi Nagar Constituency in the past three years and all the already approved works shall be executed by the concerned agencies in phased manner. Gupta said that the elected councillors and sarpanches and Panches from the respective areas have to play a vital role for the overall development of their wards and they should come forward forgetting the party affiliations so as make the Gandhi Nagar Constituency a Model Constituency. He said in last few days many works have already been started and in coming days we are going to start many approved projects. He also emphasised on the role the inhabitants of the area to cooperate with the departments regarding illegal and unauthorised constructions. He further said that before starting of any new construction people must get the authorisation from the concerned departments as per the Jammu Master Plan so that the Government agencies can provide all the basic amenities in proper and cost effective way. Gupta assured full support to the elected representatives from the Corporations and Panchayats with regard to the development of their areas. He said his doors are always open for anyone who has any complaint or suggestion for the development of the area. The people informed former Deputy Chief Minister about their grievances and problems pertaining to up-gradation of power infrastructure, sanitation and extension of existing drainage system in the area. Responding to the demands put forth by the locals regarding various development issues in the area, Gupta assured that all their genuine demands would be looked into on priority shall be forwarded to the concerned authorities for early approvals and execution of the works. Gupta was accompanied by Ankush Gupta, Kulbir Charak, Kamlesh Sharma, Dilbagh Singh, Nayan Gupta among others.